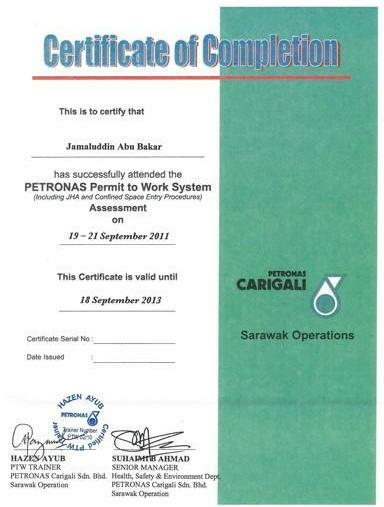 Just want to share my Petronas Permit to Work (PTW) Certificate with all of you. I attended this training on 19-21 Sept 2011 at Prince Hotel, Kuala Lumpur. For those who want to fill in the PTW form before entering/working at Petronas Carigali (PCSB) facility, they must attend and pass this training. This is compulsory and applied to all PCSB personnel and contractors.